I am an expressionengine novice, so apologies if my question reflects that. I'm looking for a way to display images in a specified order (i.e. not by date, size, etc. ), such as by ID. I've searched high and low but can't find this functionality. Is it possible?? UPDATE: user "Cheyney" helped to tease out my actual question, which was not specifying order of images within an entry (which can be done with the Move icon in the Actions column, as Cheyney describes), but rather specifying order of entries to display images on the homepage. 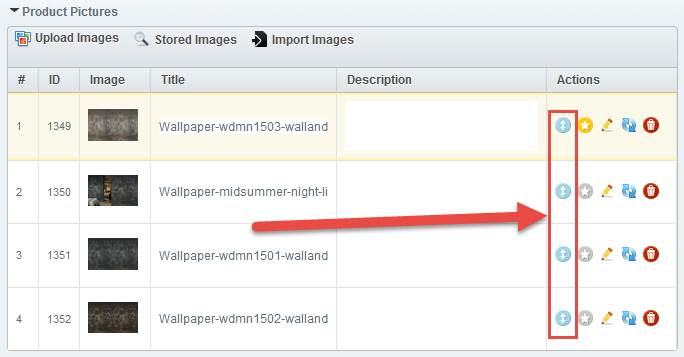 The solution was to order the entries using "orderby" within the Channel Entries tag, as opposed to ordering images within the Channel Images tag. Thanks to Cheyney for "sorting" this out for me! You can use the "orderby" parameter. UPDATE 1: If you want images in a specific order then you need to move them inside the entry into the order you want using the Move icon in the Actions column. NOTE: The cover image with always come first if your field is set that way. UPDATE 2: Based on further OP comments below here is the code to sort ENTRIES by order and then display the single COVER IMAGE for that entry. Not the answer you're looking for? Browse other questions tagged channel-images orderby sort or ask your own question. Renaming image files upon upload.. Channel Images? Channel Entry sorting refuses to sort in the right order? How to use the Channel Images' “images static”?